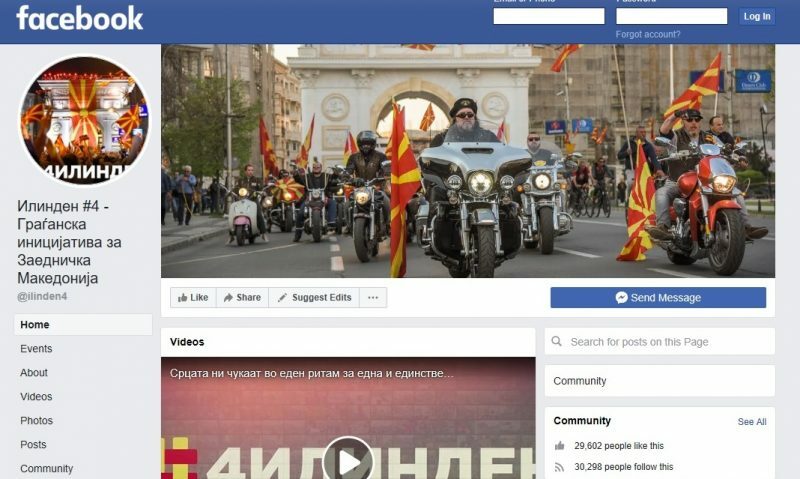 Screen grab of the Facebook page titled “Ilinden #4 – Citizen initiative For United Macedonia”, featuring members of the Night Wolves motorcycle club, with the boss of its Macedonian branch, Lenin Jovanovski, at the front. The Macedonian branch of the Russian motorcycle club Night Wolves  participated in the 2017 protests led by Macedonia's former nationalist government, which culminated in a violent storming of the Parliament  that wounded several opposition lawmakers, trial witnesses said. Thirty-three people are on trial in Skopje for terrorist endangerment of the constitutional order and security  following the April 2017 incident now known as “Bloody Thursday,” when about 200 Macedonian nationalists  stormed the Parliament building in reaction to the election of Talat Xhaferi, an ethnic Albanian, as speaker of the house. More than 100 people were injured. Night Wolves’ member Tomislav Jovanovski appeared as a witness  at the court session on December 13, 2018, and confirmed that the biker club participated in two “For United Macedonia” protests, which preceded the attack on the parliament. In an attempt to distance the club from the subsequent violent attack, Jovanovski said that they were merely against the “Tirana Platform” and that the protests in which they participated were nonviolent. The “Tirana Platform” is a derogatory term by which Macedonian nationalists refer to a list of political demands put forward by ethnic Albanian political parties in Macedonia and facilitated by Albania's prime minister. While the party ruled Macedonia from 2006 to 2017, they outwardly projected an image of amity with the European Union and NATO, while their nationalist policies at home distanced it from them. Symptoms of Russian President Vladimir Putin's influence  in Macedonia's domestic politics were not subject of public discussion during the VMRO-DPMNE rule. Who are The Night Wolves? The biker club Night Wolves, also referred to as “Putin's Angels” in United States’ media, was founded in Russia in 1989 and currently has branches in 14 different countries. Over the years, they have performed various propaganda and paramilitary functions for the Kremlin while openly supporting  Russian President Vladimir Putin. In 2014, the US placed the Night Wolves under sanctions  due to their involvement in Russia's seizure of Crimea in Ukraine. In Slovakia , they are allied with local right-wing extremists, while in Bosnia and Herzegovina they are involved in the Russia-supported militarization of the country's Serb entity. Macedonian Night Wolves boss Lenin Jovanovski also profited from his connections with the VMRO-DPMNE, such as when the government granted his transport company Sloboda Prevoz  a license to operate part of the public transport system in the capital Skopje. Meanwhile, the media kept treating him like a celebrity. Since 2011, his meetups with Putin  received major coverage. When in 2015 Germany denied him an entry visa to participate in the provocative Night Wolves’ Victory Day Ride from Russia to Berlin  through Poland, Macedonian media presented him as a martyr . In turn, the Night Wolves participated in local political propaganda, such as whitewashing the image of convicted war criminal Johan Tarčulovski . In 2013, after serving his sentence, he returned to Macedonia to a government-organized hero's welcome, which included granting him honorary Night Wolves membership . As an MP for the VMRO-DPMNE, Tarčulovski took part in the 2017 “Bloody Thursday” events. Also on December 13, defendant Aleksandar Vasilevski, a member of the security services nicknamed “Ninja,” testified that VMRO-DPMNE orchestrated the “For United Macedonia” protests including the attack on the parliament. “For United Macedonia” was formed by VMRO-DPMNE and it had figurehead leaders. 80 percent of the participants of the protests “For United Macedonia” were VMRO-DPMNE members, and the party supplied all the props and equipment that was used. I have seen all the leaders of the protests in the VMRO-DPMNE headquarters in the office of [party treasurer] Kiril Božinovski. Vasilevski said he was summoned in the VMRO-DPMNE party headquarters before joining the attack and heard some of them expressing disappointment for their MPs not escalating the situation beyond helping the mob to get into the building. A law passed before the end of 2018 granted amnesty  to the participants in the “Bloody Thursday” events who have not engaged in physical violence or acted as organizers. By backing the law, the now ruling Socialist Democrats hoped to obtain support from some of VMRO-DPMNE MPs for the constitutional changes related to solving the name issue with Greece , which was finally adopted by a 2/3 majority  on January 11, 2019. The name change is a crucial step for Macedonia to join NATO and the EU as it will stop the Greek veto on the membership. The amnesty law allowed people suspected of participating in the Bloody Thursday incidents to file applications for amnesty before the end of 2018. Sixty-six amnesty applications  were received and 12 were approved, including by MPs and leaders of the protests. “The Ninja” Vasilevski also applied for amnesty but didn't receive it. As such, he will continue to stand trial which will resume on January 14 . Macedonian media informs that the top organizers of the attack on the parliament are yet to be identified, while the pre-investigation procedure is nearly completed .